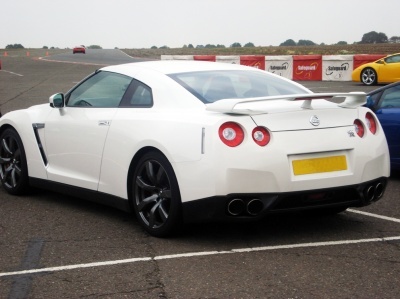 I recently bought a friend of mine a Nissan GTR Driving Experience and I thought I would write a review for you all to read as I believe it is an experience that no speed freak will want to miss! Upon arrival we could hear the sweet distant sound of supercar engines revving around the track; but once we had walked into the pits and could see the cars in all their glory… well that was an amazing site. Ferraris, Lamborghinis, Astons and even an Aerial Atom, but of course lets not forget the almighty GTR that stand there awaiting us in beautiful white. By this time I was very envious that I was not stepping into the cockpit, but nevertheless we walked up to the reception to sign in and find out our safety briefing time slot. As my friend was signing in a large whiteboard caught my eye… “Nissan GTR - 1 lap - £40, 2 laps - £65, 3 laps - £75”. I suddenly thought to myself “Why don’t I make the most of this trip and buy myself some time in the GTR too, especially as we have travelled 3 hours!” and before I knew it I had my debit card in the chip and pin machine and was given a receipt! Wow, we were both doing a few laps round a race track in the fastest production car ever to come out of Japan. After watching a quick information and safety video we walked outside to be collected by staff who were going to run us around the track a few times to allow us to get used to it. We jumped in the bright orange Focus ST’s and were briefed on the track, which was mainly information regarding where to break and the circuit lines. After 3 laps we were ready and were dropped back off at the pits, specifically the helmets room where we collected our medium sized helmets. Back at the pits and looking at all the beautiful Italian supercars there were people of all ages asking the instructors which of all the cars was the fastest. To their amazement they were told that their new Lamborghini Murcielago Limited Edition car was, very shortly followed by the Nissan GTR. That’s right, it costs a quarter of the price of many of the cars at the circuit but was quicker than all of them bar the new lambo! Impressive, good old Japanese! Anyway, back to the review, it was Vinnie’s turn to step in to the twin turbocharged 3.7 litre monster…. And he was off! Well, not quite as entering the track was rather slow (just to be safe) but once I could see him reproaching the straight I knew that he was going to give it some juice. He came around the corner and after a couple of seconds was nothing but a blur in the distance. By this time I was pretty excited about getting my chance to drive it! Before long I was sitting in the drivers seat. The interior was really modern, full of gadgets and everything was laid out in the most perfect place; like somebody had planned out just the dashboard over years! After a quick introduction to the instructor and cars features I was told to fire the GTR up. I pushed the ‘Start’ button to hear the low pitched rumble of the engine and pulled away. I took the first lap fairly slowly whilst I familiarised myself with the car, but as I came back round past the pits and out of the large corner I thumped my foot the floor through to the straight ahead changing gear when asked to by the instructor on the steering wheels shift buttons. The acceleration of this car was out of this world, it just pulled like a train through every gear and felt like it would go on at this rate forever! The experience was over way too quickly for my liking and it has left me craving another drive in the GTR. Maybe if I start saving my pennies I will be able to afford one in ten years time…donations anyone?